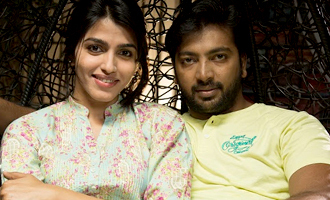 Actors Kalaiyarasan and Sai Dhanshika got noticed for their performance in director Pa.Ranjith’s ‘Madras’ and ‘Kabali’ respectively. The duo have been acting in quite a few films in the ladder to stardom.’Yeidhavan’ starring Kalaiyarasan and Satna Titus in lead roles and ‘Raani’ starring Dhanshika as the solo female lead will be hitting the screens on the same day that is May 5, 2017. Interestingly two weeks after this, the film ‘Uru’ will be hitting the screens on May 19th. This film will have Kalaiyarasan and Dhansika in lead roles. Touted to be a horror thriller without a ghost, ‘Uru’ has been produced b V.P.Viji under Vaiya Medias banner. the supporting cast of the film includes Mime Gopi, Daniel Anne Pope Tamil Selvi, Karthika and others. The film has been written and directed by debutant Vicky Anand. Prasanna S.Kumar is the cinematographer while Johan is the music director of the film. Editing is by San Lokesh. The young filmmaker confirms that there is not ghost in this horror film. “Most of the shoot happened in night time and we got into trouble few times because of forest buffaloes in forest which roam around as a gang, The shoot took place during the month of December. The climate was cold around 4-5 degrees, Kalaiarasan and Dhansika struggled a lot during the period of the shoot,” he adds. ‘Uru’ is all set to hit the screens on May 19, 2017.